Performance of AI strategies has not yet exceeded traditional methods. second catalyst behind AI’s phenomenal growth is the availability of data.It allows engineers to teach algorithms to adapt and learn skills without human intervention. This story appears in the October / November 2017 issue of Bloomberg Markets. Over time, Granger built up the firm’s confidence in the technology. By 2015 artificial intelligence was contributing roughly half the profits in one of Man’s biggest funds, the AHL Dimension Programme that now manages $5.1 billion, even though AI had control over only a small proportion of overall assets. Elsewhere in the company—and in the industry as a whole—AI technology is being used to find the speediest way to execute trades, to make bets on market momentum, and to scan press releases and financial reports for keywords that could signal that a stock will rise or fall. Even Man’s very human discretionary division, where business is centered on experienced asset managers, is exploring AI techniques. Those big clients Ellis was initially worried about clearly like what they’re seeing and have rushed to join Man’s algorithm-centric funds. All told, four Man funds collectively managing $12.3 billion are incorporating AI. Assets under management at Man have surged about 77 percent since the beginning of 2014. AHL Dimension fund assets have more than quintupled since then. bunker but on a pedestal. “It went from a total isolation to ‘OK, you are allowed to sit at dinner with the rest of us, but don’t talk’ to the point where it’s become a part of the family,” Ellis says. For the uninitiated—most of us—watching an artificial intelligence system at work is like trying to decipher an impenetrable language. Slavi Marinov, a 31-year-old Bulgarian computer scientist hired by Man two years ago, is attempting to translate the code into understandable terms for a pair of visiting journalists. In what he insists is an elementary demonstration at Man’s London headquarters, Marinov types commands onto a black screen. The keystrokes tell the machine to find patterns in futures market returns. The cascading numbers show the computer “thinking,” crunching data at speeds a human could never achieve. “The element that makes the decision is these layers of numbers,” says Marinov, who made education software at a startup before joining Man. As seconds pass, the system is adjusting what data to give more importance. It’s coming up with a probability for what’s going to happen next. Once the machine determines an optimal position to hold based on that information, it takes stock of broader market trends and the cost of making a trade before deciding whether to go forward. All in a few moments. At Man and other hedge funds, two interconnected factors drive the adoption of AI. First, consider the exponential advances in computing power—even from the first iPhone to the 10-year anniversary model. Man has a vast data center outside London filled with row after row of servers. The machines are loaded with cutting-edge processors that until recently might have been used to render graphics for advanced video games. Each processing card costs about $1,000, a fraction of the cost a decade ago. The second main catalyst behind AI’s phenomenal growth is the sheer availability of data. If processing power is AI’s engine, information is its fuel. It allows engineers to teach algorithms to adapt and learn skills without human intervention. Marinov types a few commands into his computer to pull up an online waiting list used by engineers who want time on the company’s top-end equipment. The demand can be so high that a warning alert is triggered if the processors are getting hot from overuse, like an Xbox that’s been played all day by a teenager on summer break. The sort of machine learning that Man and its competitors are adopting has been around for decades; a New York Times article from the 1950s describes an algorithm trained to classify images. But the technology is only now beginning to live up to its promise. At its most basic, a machine learning system is taught how to make judgments based on lessons from historical information. These tools are being applied to reading X-rays, answering questions people ask of Siri and Alexa, self-driving cars, and improving energy efficiency. Facebook and Google taught computers to identify dogs, cats, and other images in photos. Computer code has been a standard tool on trading floors for years. Telling a computer what to do when certain things happen is the foundation of quant funds that have long used statistical analysis to find advantages. Machines could perform a task five times or 5,000 times, but the code would never change or evolve without mathematicians, engineers, and statisticians intervening. Artificial intelligence goes further by enabling the system to adapt based on the information it receives. At Man, engineers set parameters: exposure caps, asset class, volatility, trading costs, etc. Compliance and risk management rules are ingrained into the system’s DNA, preventing it from going rogue or breaking the law as a fast track to profit. These constraints set up the borders within which the machine does its work. The system then seeks out patterns, making connections among the data that humans can’t see. AI makes educated predictions based on what happened in the past, trading when the odds are in its favor. Man has several such systems at work. The fastest trade several times per day; others hold a position for two weeks or more. Man Group’s research into artificial intelligence happens in a tall building with views of the 18th century Radcliffe Observatory at the University of Oxford, a short train ride west of London. The company’s engineers, statisticians, and coders share the space with academics and researchers studying how algorithms, AI, and related advances can be applied to finance. The partnership, called the Oxford-Man Institute of Quantitative Finance and funded with an initial £10.45 million ($14.2 million) endowment from Man Group, gives the hedge fund access to experts and an early look at technical papers. AI engineers use punishments and rewards to guide the machine; it’s like teaching a mouse to push a button for food. In what’s broadly known as deep learning, algorithms are trained to hunt for predictive patterns within libraries of historical information. They are “stimulated” when they find similarities in, say, the pricing data of stocks or commodities. In another approach, called reinforcement learning, the machine recalibrates itself on the go according to the success or failure of certain actions. Researchers also program penalties into algorithms to discourage certain behavior by the AI, such as creating strategies that are too similar to those humans already employ. As promising as Man’s technology may be, the firm is battling industry headwinds. Investors are revolting against high fees charged by hedge fund managers who produce mediocre results. Last year clients pulled out $112 billion from the industry. In the past two years, more hedge funds have shut down than have been started. Man Group’s stock is up 40 percent this year, but it’s still down 77 percent from its pre-financial crisis peak in 2007. An encouraging sign for Man is that investors everywhere are trusting their money increasingly to technology. Computer-driven quantitative funds—the cluster that’s invested heavily in AI—are the only part of the hedge fund industry that grew last year. Others exploiting AI include Renaissance Technologies, Two Sigma, and Bridgewater Associates. Paul Tudor Jones, the billionaire U.S. investor, reportedly is adopting some of the technology after experiencing sluggish returns. Point72 Asset Management LP, the family office that manages billionaire Steven Cohen’s fortune, also has been hiring experts in the field. But AI isn’t a magical machine. You can’t just pour data in at the top and expect money to gush out of the bottom. Many algos turn out to be duds. Some Man employees warn that AI often produces theories that are already known—an expensive waste of time—or predictions that don’t translate to real-time trading. Luckily for Man, the system has been right more often than not, making small amounts of money gradually rather than placing big adventurous bets. “We are not trying to put something out there that takes huge amounts of risk,” Granger says. At about 2:45 p.m. in New York on May 6, 2010, the stock prices for Accenture, CenterPoint Energy, and other companies suddenly plunged to a penny per share. Procter & Gamble’s stock fell almost 40 percent. At the same time, shares of Apple, Sotheby’s, and others momentarily leaped to more than $100,000 each. Markets were in chaos. No single cause explains what became known as the 2010 Flash Crash, but as researchers and regulators picked through the pieces, the role of machines was a unifying thread. Algorithms sent automated trading systems chasing after themselves with catastrophic consequences. This moment of mayhem and others like it—Apple’s stock fell suddenly again in 2012—showed the expanding and sometimes counterproductive role computer code plays in the financial world. AI brings new complexities to the market. The self-altering systems operate in ways that aren’t always clear even to their creators. That’s OK as long as money is being made, but if things go haywire, these technological advances are bound to come under scrutiny. And AI programs will only get more complex as computing power increases and more data become available. A Swiss neuro­scientist, Pascal Kaufmann, recently joked that we’ll know artificial intelligence has advanced to humanlike awareness when it starts cheating. Dark humor, yes, but also an ominous warning. Jeff Tarrant, founder and chairman of the investment firm Protégé Partners, has spent several years studying artificial intelligence in finance. He says that while the technology is still in an early phase of adoption, it will have a transformative impact on the industry—one he compares to Uber Technologies Inc.’s on transportation. Despite its aggressive adoption of AI, Tarrant says, Man Group is among those at risk of being upended. 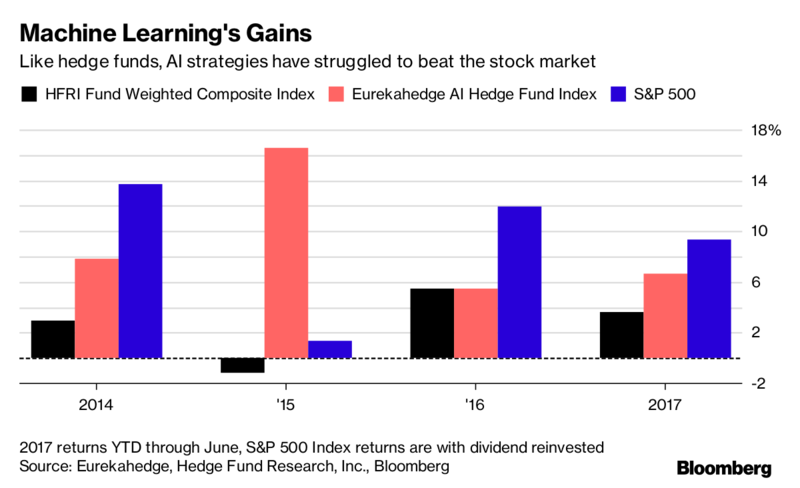 Some new AI-focused funds charge a 1 percent management fee and 10 percent of the profits, half as much as a typical hedge fund. At pure AI firms, much of the process is automated, so there’s no need for a huge workforce. Tarrant says power in the industry is shifting to those who build the best technology, not those who have the most talented portfolio managers. “There is going to be mass unemployment in asset management in the next several years,” he says. Behind all the hand-wringing is a broader philosophical question: Why are we turning more of the financial system over to computer code in the first place? What’s the upside of diminishing human involvement? In medicine, AI has the potential to spot diseases earlier and save lives. Self-driving cars could reduce the number of fatal accidents. In finance, however, the answer is less clear. Advocates say the technology has the potential to make markets more efficient. Stocks and other securities will be accurately priced because machines will be able to process more available information. For its part, Man Group says the technology sharpens its edge to the benefit of clients, including pension funds and retirees. It’s an attractive argument: Who doesn’t want their retirement account to grow? Several years have passed since Granger’s initial decision to give money to Man Group’s AI. He’s been rewarded for his instincts: He became AHL’s chief investment officer in July. Granger finds satisfaction in not knowing why Man’s AI system is making certain trades. It means the technology is discovering things he doesn’t know. “Some people like that, some don’t,” he says. Fear of technology is overwrought, Granger says. He thinks back to one of his favorite books, Robert Harris’s The Fear Index, a beach-read thriller about a brilliant mathematician who builds an AI-based hedge fund in Geneva. His system works perfectly. It makes him insanely rich. Then it tries to kill him.